This steel cut oat bake is as tasty as it is healthy, making it the perfect breakfast for weekend brunches that can easily be reheated throughout the week. The recipe is naturally delicious as is, but you can top with sweetened or flavored yogurt to take it to a whole new level! This Mother’s Day is particularly special since its my first time being a mama myself! No offense to my own mom, I love celebrating you each year, but now that I have a baby of my own, my level of appreciation for motherhood is at a whole new level. Us mamas deserve a nice brunch once a year at the very least. So, if you’re looking for a healthy breakfast to wow your mother with, I’ve got a fantastic one for you. This steel cut oat bake is so incredibly good. It just uses oats so the texture isn’t as nutty as the cherry almond quinoa oat bake I posted a while back. The toasted coconut also adds a whole new level of tastiness that pairs perfectly with the strawberry and banana. Its simple addition my friends. If you’re not a steel cut oat lover already, you definitely should be. Your standard rolled, old fashioned oats are flattened and steamed while steel cut oats skip this and are just cut into smaller pieces. The texture is a bit chewier than standard rolled oats and can be really creamy and delicious when cooked. Steel cut oats take longer to make but have more fiber and are overall less processed, which makes them not only healthier than standard oats, but one of the healthier grain choices out there in general. Steel cut oats work perfectly in dishes like this steel cut oat bake and substitute well in overnight oat recipes, like this strawberries and cream one. 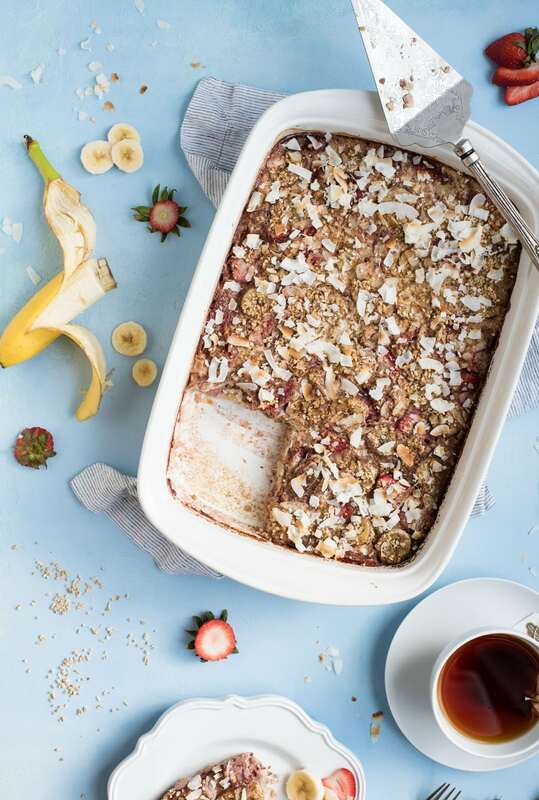 In addition to all those oats, this steel cut oat bake is absolutely loaded with fruit. With strawberry season coming up and berries tasting fresher by the day, its the perfect time of year for a steel cut breakfast bake like this. Most people know that bananas are full of potassium but they’re also a great place to get your vitamin B6 and fiber too. Strawberries have Vitamin C and are overall one of the tastiest fruits on the planet in my opinion. And can we talk about the toasted coconut already?! I love any and all coconut, but toast it and I’m utterly smitten. Coconut is my weakness. I still don’t understand how so many people don’t like it. And there’s a hack to this whole toasted coconut thing… you can totally do it in the microwave. Just watch it very closely however you cook it because once it starts, it’ll brown really quickly and is super easy to burn. Here is your standard play by play showing you just how easy this steel cut oat bake is to make. Like the cherry almond breakfast bake I mentioned earlier, I got the inspiration and technique for this from Olena at iFOODreal. She has a breakfast bake recipe that I love and have been making variations of ever since finding it. Its all about the layering baby! In just a few simple layers, the base of the recipe is made, and then you pour the liquid over it and pop it in the oven. Easy peasy. This steel cut oat breakfast bake is a great recipe to make on the weekend and reheat for quick weekday breakfasts too. That’s our normal go-to for getting out the door quickly in the morning. If you’re more of a savory fan, these egg muffins reheat well and are pretty delightful too. For me, eating healthy comes down to having stuff like this prepped so when I’m ravenous, its easier to eat healthy and scarf a serving of this than it is to hit up a Starbucks drive through or dive into those office donuts that seem to manifest all to often. Set yourself up for success and you’ll amaze yourself at what you’re able to accomplish in changing your diet. Here’s a peak at what all those layers come together and do in the end. Its basically like baked oatmeal but so much better than lots of other baked oatmeal recipes I’ve tried. I used cardamom to give it a bit of a unique flavor but if you don’t have that spice, using a touch of extra cinnamon will be just fine. Cinnamon is really great for you too so it does more than add flavor. Its a fantastic antioxidant, anti-inflammatory, and even shows signs of being beneficial for preventing cancer. There are too many health benefits to list so here’s an article that goes over them in detail. Its truly a wonder spice! I know my baby is barely five months old but recipes like this steel cut oat bake already make me excited to cook with her. Its definitely easy enough to do with kids and they’ll love it because its sweet, while you’ll love it because its a healthy breakfast. I remember baking and cooking with my mom from an early age and these memories are some of the ones I treasure most. She passed her love of all things food related right onto us. Looking back, I think her willingness to try new recipes with me and my sisters and put up with the clumsy chaos that kids bring to the kitchen was such a gift. While I love eating out, we’re a family that loves to cook too and I’m so happy that I learned to do this from such a young age. Spread coconut out in an 11x7" baking dish and toast in preheated oven for about 5 minutes until coconut is just starting to turn lightly browned. Remove coconut from oven. Use a flat spatula to remove from baking dish and set aside. Spray baking dish down with cooking spray (you can wipe the excess coconut out first, but don't have to). Layer half of the fruit evenly in the baking dish. Top with half of the toasted coconut. Layer steel cut oats on top of this and then top with remaining strawberries, banana, and coconut. In a mixing bowl, whisk eggs until light and frothy. Add almond milk, maple syrup, vanilla, cinnamon, cardamom, and salt and whisk to mix thoroughly. Slowly pour liquid mixture over fruit and oats in baking dish. Place in oven and bake for 50 - 60 minutes. Let cool for 10 minutes before cutting and serving. You can serve with sweetened yogurt if you like, but its perfectly good without it. What a coincidence! Cooking together is one of my favorite memories too! I actually miss it. Thanks for the gift of this recipe. Can’t wait to try it!